Comment. Regarding the political aspect re this and other issues, they can’t seem to find middle ground. Obama just made a great speech making this point at Urbana. And only the people can remedy this if people lived up to their responsibilities required to make democracy work. I have friends, progressives of course, who are writing the environment and the future off but I do not subscribe to that. Armageddon is too extreme in my opinion. There has been huge progress in the use of alternative sources of energy but, as you say, there will still be the continuing necessity of using using fossil fuel for some time. I’m relatively confident that technological progress will improve the use of alternatives, but I said relatively. One of the big problems is the transmission from sources to areas of need. Much is lost with transmission over large distances. Second, there is the matter of storage and while considerable effort is being made in solving this problem, there still has been no breakthrough. Anyway, this is a major problem but the energy industry (think Koch, et al) and their lackeys in the Congress keep fighting any solutions. Could this be greed? Perry, this was a good subject choice on your part. It gets people to think! Good going. Hey Dave…glad to hear from ya again + thx for the wise words! Yeah, the polarized + win-at-all costs nature of modern politics is definitely obscuring us from the truth. And in addition, it’s obscuring us from the ability to think of the needs of our country first, + our political party second. Obama did make an impassioned + eloquent speech about finding the middle ground in politics recently. Unfortunately, by laying much of the blame for our lack of political dialogue on Republicans, Obama probably didn’t do much to encourage the kind of common sense-bipartisan political solutions that we used to see in the past. As ya know Dave, common sense dictates that the amount of fossil fuel usage that we have is having some negative impact. Therefore, renewable energy should definitely be encouraged. However, + this is the complex part…it may be that we aren’t quite yet perched at an environmental armaggedon. I definitely agree with you that even though some of these extreme fears may be somewhat over-stated, it doesn’t mean that we shouldn’t be prudent + encourage alternative sources of energy for the future. And as you say, if we can work out the issues with transmission + improve solar + wind technology, the future will definitely see a big rise in its use. And yes, there’s a lot of interest in keeping the status quo of fossil fuels intact. However, even though fossil fuels will still be needed in the future, that shouldn’t obscure us from working together to improve cheap renewable energy. Ironically, progress + development, which is sometimes viewed skeptically as being bad to the environment, has been shown to be helping 3rd world countries stabilize population growth. In turn, this reduction in population growth can then have a positive impact on the environment. Dave, I’m glad that my blog encourages people to think of ways to work on these problems. Thx for the dialogue! Hi Crosslife Spaces…thx for stopping by! Yes, polarization has tended to increase with technological advancement. After all, the rise of social media + its bullet point format, is often cited as contributing to this. As you say, Liberalism may in fact contribute to an increase in polarization due to the fact that it sometimes encourages an attainment of an ideal that might seem out of reach to some. Like rats and roaches, humans can live anywhere, eat anything, and breed under extreme conditions, so armageddon in the sense of extinction seems less a near term outcome. Whether it will be a world any of us would want to live in is conjectural, but of a certainty it will be just normal for inhabitants of the future, whatever it is, as it ever was. The business of environmental change remains mostly a trope of tribal politics in the U.S. at present. There are places in the world where it is becoming a clear and present danger, but is not yet causing the projected mass population dislocations. If and when that occurs, we ain’t seen nothin’ yet as to social instability, a prospect to make our current tensions over migration/immigration pale by comparison. A basic issue will be, as easily enough seen even here and now, is that environmental degradation does not affect everybody equally, and the haves will see a need to shore up their defensive positions ever more stringently. Sayers have been naying Malthus ever since, and technology has improved to avert predicted disasters. Optimists continue to believe that ever more technological innovation will come along. It had better or there will be, as they say of the market, a correction. But hope is not a plan. Hi Charlton…thx again for stopping by + the in-depth comment! You hit on many important points here. Yes, it probably is so true that mankind’s ability to adapt will indeed make it hard to perceive environmental problems at times. And yes, it goes without saying that the have-nots will probably suffer more from environmental degradation. This is often what we see in the 3rd world or in poor communities in wealthy nations. As for Malthus, he cannot be discounted. After all, even though his mind was more focused on food production + rising populations, his thinking can also be transposed somewhat onto the environment as a whole. Interestingly, I wonder if its possible that Malthus + his dire predictions actually helped give us a blueprint of what to avoid. If Malthus hadn’t sounded the warning, would we be complacent? And yes, there may be a time when Malthus is proven more correct than he currently has been. As for the fact that hope is not a plan, you’re correct. Ironically, development is a necessary 1st step to stabilize population growth. And it goes without saying that this feature helps us to plan for the future. Thx again Charlton for your thoughts on this! It would be unfair to deny that great strides have been made in environmental awareness and protection. Still, most people would agree, more could be done to better balance environmental protection with resource use. It is inaccurate to say that environmental protection has harmed economic development. Societies increased valuation of the environment has only increased the economic value of natural resources and profoundly helped businesses profitability. It is understandable that a more nuanced approach, would also be more complex. Easy to see how some would get frustrated when those complexities are realized as regulations and guidelines. What they fail to realize is, recognizing the inherent complexities, is the first step in giving something it’s proper value. Yet some still see the loss of an old paradigm as a loss of value when in fact, there’s been a net gain. But I get it, transitions are hard. What is meant by the economic value of something? There’s an incorrect assumption that a monetary system is an objective phenomenon. Far from it, it is our values that give these systems their worth. Stocks, bonds and little pieces of paper we call money, it’s all meaningless, without society assigning a value to it. It is what society values, that determines the worth of something. Do we value honesty and polite social decorum? Or do we see greater value in conflict and abrasiveness? Do we value clean air and water? How do we assess a healthy thriving environment? Do we as a society want to move purposely towards holistic interaction with our world? Or are we fatally attracted to divisiveness and degradation? Are we thoughtfully evolved enough to anticipate and make changes to bring about a world we desire? Or are we hopelessly doomed to consume all available resources and drown in our own excrement? Society is right to react to alarming levels of pollution and the disparity of resources. It would be insincere to say that market forces alone could correct these problems. Or that technology would evolve on it’s own to be curative. Both these propositions are logical fallacies. Society must impose a value system to both technologies and to the markets, if we hope to have a meaningful outputs from either. It’s basic marketing. Provide something that society already values, or create value with a novel approach. So far, piles of toxic waste and poisonous groundwater have not caught on with the public. Bankrupting the environment and leaving nothing for future generations just doesn’t seem to be as popular as it might ones have been. The complexities of working with our natural environment are here to stay. Delaying action is still, inaction. Those that embrace the increasing value of the environment, will see their values increase as well. As Mark Twain and Roy Rogers have said, “Put your money in land, because they aren’t making any more of it”. Yeah, you hit on many deep ideas here. Although there traditionally has been thought that development has stood in the way of the environment, it is indeed hard to say that environmental protection always harms the economy. For instance, look at the situation with improved auto emissions standards. If we look back at the improved emissions standards of the past 30 years we see that not only do we have cleaner air to breathe in most of our metro areas, we also still have a robust usage of automobiles in society. Somehow, the economic cost of improving emissions standards didn’t really reduce our reliance on cars + trucks. In fact…maybe it made them more attractive to us. When one looks at the wide variety of vehicles out there, from sports cars to trucks, sedans, + SUVs, we have incredibly high-performing vehicles that operate within emissions standards that have resulted in cleaner air. Therefore Tom, you’re correct to say that not all environmental protection issues hurt development. Likewise Tom, the success of certain aspects of the recycling movement, such as paper, show that on an economic scale, environmentalism can be profitable. The tricky part with all environmental issues is assessing the true nature of what’s called environmentalism + a negative environmental impact. To give conservatives credit on this issue, it’d be good if liberals would be more patient with conservative questions of the environment + explain them more + encourage dialogue. After all, a balanced approach to the development-environment equation recognizes that a certain amount of natural resource usage is necessary not only now but in the future. Unfortunately + often now, some liberals tend to lump many extraction + development industries into a negative category on a political level. After all, how often have we heard a liberal call out a conservative for being cozy to business + bad for the environment? Unfortunately, by calling those that question them negative things such as deniers, liberals are missing out on a dialogue that could not only increase buy-in to the environment, it could also heal some of the political division currently out there. Tom…you’re correct to note that on an economic scale, placing value on the environment is not always a losing proposition. And yes, you’re correct to note that it can definitely be a winning + profitable one! Very well written article, a good read, so I am going to reblog this for you. I would say that many environmental impacts are now irreversible and we need to focus on adapting to the new situation every bit as much as trying to reduce our future impact. Another interesting post, Perry. All I can say is that if you look to history, the only solutions that worked for problems caused by advancing technology have generally been from other advances to technology. The idea of solving environmental problems by somehow trying to return things to the past and do it better this time isn’t rational. We need new technology to cure the problems caused by older technology when it became new. It’s just like inflation. Trying to compare a new 1992 computer with a new 2018 computer with the same price leaves out the consideration for the fact that the 2018 computer can probably do a million times as much stuff as the old one for the same price. In the same way, technology moves forward. You can look at history to see what has happened but that doesn’t always provide an answer for what we need help with today. With your strong background in science, you’re able to understand the concepts behind technology + how that technology is born out of scientific knowledge. Obviously…whether one looks at the environment from the left or the right politically, the key is sustainability of not only our physical environment, but also of our lifestyles + economy. And yes…new technologies, in addition to a certain degree of environmental preservation, hold the key to the success of the total environment. Thx for these insights! Hi Fred + thx for stopping by! From the looks of your blog, you have great insight into the environment. Also, although there’s much debate on which environmental impacts are reversible, I agree that it’d be best for us to focus on new ways to adapt to environmental changes as opposed to just debating about impact. And of course, reducing our future impact is always a win-win. As an example we have forests full of dead trees. 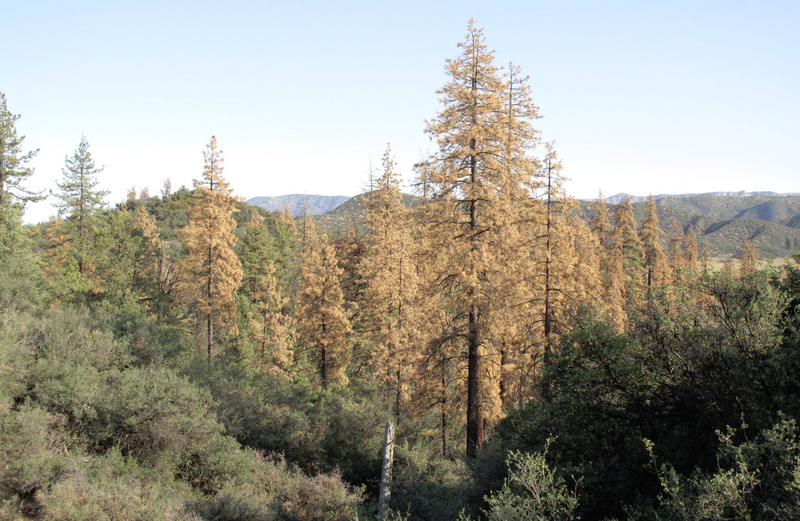 Bark beetle plus extended drought plus warming equals massive forest fires. Lets chop *those* trees down, the dead and dying ones. The remaining growth will have more room and less competition. Fires will be less intense. We will have sequestered all that carbon from the environment for a while. Ain’t gonna happen. Local “environmental” groups are dead set against any lumbering at all. Compromise is possible but nobody is willing. I hear what you’re saying Fred! I’m sure that in your hikes + travels you see much of this. Here in Oregon, we’re facing the same situation. Yes, it’d be so wise to take the dead + dying trees out to not only use but to reduce the fuel for fires. After all, mankind has often followed this practice thru the centuries. Compromise has to happen at some point. After all, as you said, adaptation is key to so many of these issues. A spark gets into this and it will be nasty. I agree Fred…if one is interested in reducing forest fire risk, there’s no reason not to thin out in these areas.